ChlorKing Adds Self-Clean Upgrade to NEXGEN Onsite Chlorine Generators - ChlorKing, Inc.
Norcross, GA March 8, 2018 – ChlorKing has reduced scheduled manual-cleaning requirements for its NEXGEN onsite chlorine generators with the introduction of five new models with self-cleaning capability. The upgraded NEXGENs automatically begin a cleaning cycle every three hours to remove calcium deposits from the electrically-charged plates that convert a mild saline solution to chlorine to sanitize swimming pools. The new models have daily chlorine-production capacities of 10, 20, 40, 60, and 80 pounds, respectively. The NEXGEN self-cleaning system uses the same reverse-polarity technology that has been proven successful on ChlorKing’s CHLOR SM salt chlorinators. In operation, the power supply reverses the polarity to remove the calcium buildup. NEXGEN technology generates pH-neutral liquid chlorine, chemically known as bleach, from salt, which is stored onsite. In addition to eliminating the need to store bulk chlorine, it eliminates the accidental mixing of chlorine and muriatic acid by human error, a major cause of chlorine-gas releases. In addition to eliminating the safety issues associated with bulk chlorine, ChlorKing provides long-term price stability. Salt, the chemically inert raw material, costs less than bulk chlorine and is not subject to price volatility. NEXGEN systems can produce liquid bleach for sanitization for 43 cents per gallon, which is about one-fifth the cost of bulk chlorine. Automated feeders add salt to the NEXGEN production tank as required to maintain safe disinfection levels. Pool owners can also Sentry UV light systems as a supplemental disinfection to destroy chloramines and inactivate waterborne pathogens on contact. 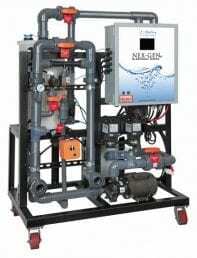 UV and saline-based sanitization systems are available through ChlorKing’s 36- and 60-month Equipment Supply & Maintenance Programs, which substitutes a fixed monthly payment for a large capital outlay. ChlorKing has reduced scheduled manual cleaning requirements for its NEXGEN onsite chlorine generators with the introduction of five new models with self-cleaning capability. Daily chlorine production with the new units ranges from 10 to 80 pounds.